GBA Sonic Advance (USA) in 11:17.47 by nitsuja. This Sonic Advance movie is unique as a speedrun in one aspect: the hero (Sonic) moves so fast that the "camera" of the game cannot even follow him. Therefore, Sonic is rarely seen in the movie. Note: this run has two AVIs available for download. The second one is normal, 45.5 MB in size and shows the movie including the credits and all. 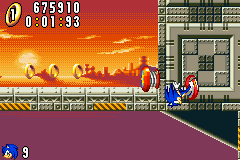 The first one is 73.8 MB in size and it shows two screens side by side — the one on the left is identical to the normal version; the one on the right is made with a special emulator, hacked to force the game's camera to focus on Sonic, making it much easier to follow what nitsuja is doing with him. Unlike the first video, this version doesn't show the credits and anything following them.